McCausland of Toronto is the oldest surviving stained glass studio in North America. The founder, Joseph McCausland (1828-1905) was born to Anglican parents in County Armagh, Ireland and came to Toronto with his family in 1835. His early artistic aptitude is revealed in an account he submitted at the age of eleven, for “painting, graining, marbling and varnishing wood and for frosting glass in imitation of ground glass”. Joseph founded his design studio in 1856 and enjoyed immediate success, supported by the multitude of churches being built in the burgeoning city and province. The diversity of the firm’s work can be gauged by an early advertisement offering “figures under canopies, memorial windows, coats of arms, ornamental stencilled windows, embossed and enamelled work, landscape windows for halls and stairways, and bent glass”. Robert McCausland (1856-1923) was the artist who made the firm’s reputation in stained glass. He returned from extensive study in England and Europe to become chief designer in the stained glass studio. It was split off from Joseph’s design house across the street, and was briefly called Canada Stained Glass Works before changing to the name it is known by today. In England, Robert had become connected with leading studios and their designers. The McCausland studio benefitted enormously by using English-trained artists. 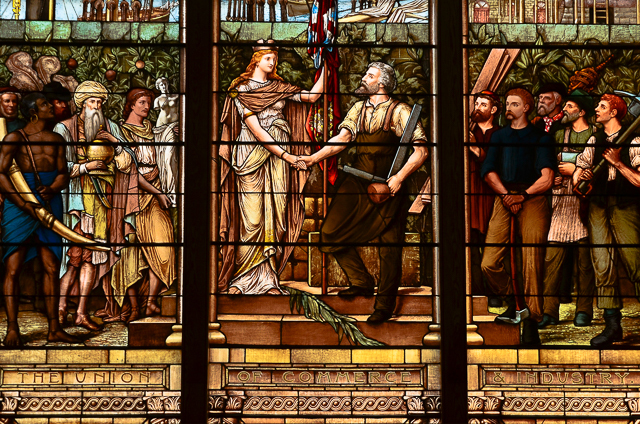 Stained glass had become an large and celebrated industry in England during the last half of the nineteenth century, with artists of the Victorian era vying for projects and prestige. Robert also kept abreast of trends in the United States in the era when Louis Comfort Tiffany and John LaFarge were making radical technical innovations. “The possibilities of either [American or English] style are not gauged by individuals or centuries but lend themselves to a thousand and one phrases which will always allure the creative mind,” McCausland wrote to a friend. His stated priorities were always colour, design and painting. English designers working for McCausland were often members of the prestigious British Society of Master Glass Painters. Robert brought a stream of skilled English artisans to Toronto. If they chose not to move to Canada, he would sometimes collaborate with them across the Atlantic, and the final cartoons would be sent to Toronto, where the McCausland painters, cutters and assemblers would execute the design. The Union of Commerce and Industry, 1899. (lower section) Old City Hall, Toronto. The studio rose steadily in importance and reputation. Robert became a member of the Ontario Society of Artists and the esteemed Royal Canadian Academy of Arts. 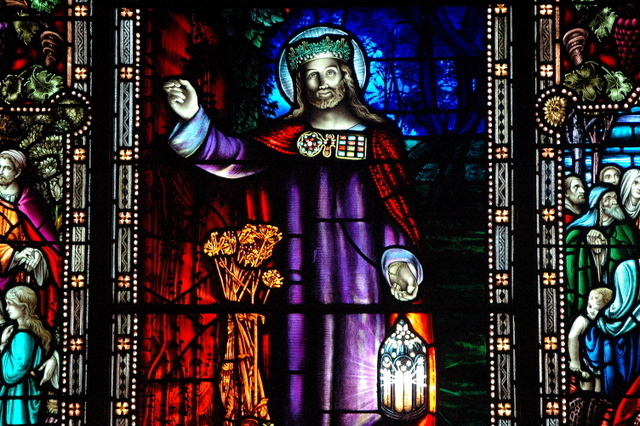 McCausland became the preferred Canadian stained glass maker for Anglican and sometimes Roman Catholic churches in Ontario, and in the four Western provinces, as they developed after 1870. 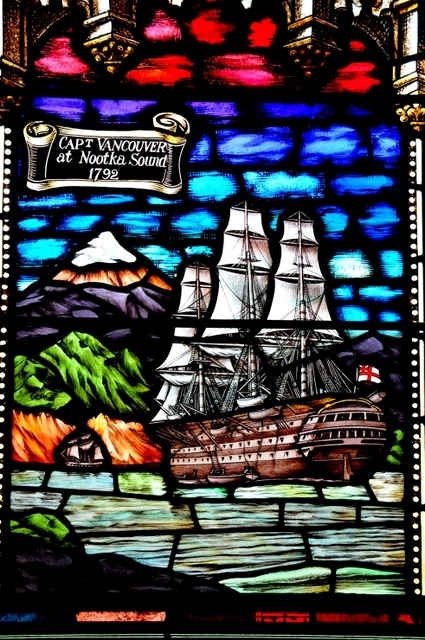 While some churches still commissioned windows from England, Germany, France and the U.S., McCausland was a very respectable Canadian alternative. Robert’s skill can be judged by the magnificent dome created in 1885 for the Bank of Montreal in downtown Toronto, designed to be the most impressive commercial building in the country. The dome, restored a century later by Robert’s great-grandson Andrew, is now within the Hockey Hall of Fame. Some of Robert’s collaborations with English artists can be seen at Trinity College, University of Toronto (1886-1888); the Old City Hall (1897-1899) and the Chancel windows at St. Paul’s, Toronto and Holy Trinity Anglican in Winnipeg. Robert died in 1923, having established McCausland as the leading glass maker in English Canada. Five generations of McCauslands have overseen the work of the firm: Joseph (active 1850-1896); Robert (active 1897-1923); Alan (active 1923-1952); Gordon (active 1952-1968); and Andrew (active 1969–present). Some designers worked for McCausland for a time in Toronto then set up successful studios of their own, like Nathaniel Theodore Lyon and William Meikle (active c. 1900-1940). The English-trained artist David Johnson, on an installation assignment in Regina in the 1970s, made the decision to stay there, and over the next thirty years became Saskatchewan’s leading glass artist. 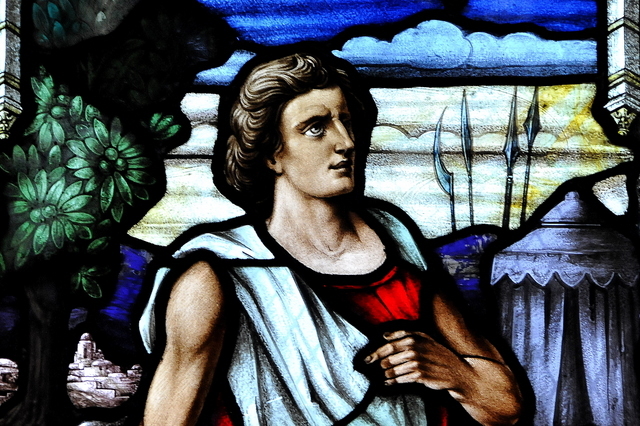 McCausland windows have been the expected presence in more than a thousand Canadian churches for a century and a half, leading to frequent repetition in styles and themes from one city to another. For example, windows based on William Holman Hunt’s famous painting The Light of The World (1853) exist in hundreds of Canadian churches, usually executed by successive McCausland generations. In the early 20th century, versions of Holman Hunt’s wildly popular pre-Raphaelite painting would tour the country by train, and local crowds would pay to see this epitome of the English Arts and Crafts movement. (Holman Hunt was recently the subject of an exhibition at the Art Gallery of Ontario) Variations of The Light of the World can be seen in most Anglican churches across the country, like the fine version at the University of British Columbia (photo below; and in detail in the Vancouver section of this site). Before the era of mass visual media, parishes naturally requested subjects and treatments they had admired elsewhere. Relieved of costly design time, the studio could accommodate clients with more modest budgets. When budgets and creativity coincided, the McCausland studio achieved delightfully fresh windows, as with the 1885 dome in what is now the Hockey Hall of Fame in Toronto. At St. Mark’s, Niagara-on-the-Lake, (the oldest Anglican church in Ontario), Robert’s lovely “Easter Morn” is often mistaken for a Tiffany creation. The Foy window in St. Michael’s Cathedral and the Massey window in St. Andrew’s United, both in Toronto, and the Gildersleeve window in St. George’s Anglican Cathedral in Kingston are further demonstrations of Robert McCausland’s vision and finesse. McCausland compositions often include rich groundscapes beneath the main figures, such as the flora in St Alban’s Cathedral in Prince Albert (1910) and the seashells at St Andrew’s United in Moose Jaw (1966), both in Saskatchewan. Originality may be seen widely in twentieth century windows by Robert’s descendants: a trompe l’oeil Nativity at St. John’s Anglican Cathedral in Saskatoon; abstract motifs and twentieth century figures like Gandhi and Martin Luther King at St Andrew’s United, Moose Jaw; the thirty splendid panels of Canadian history at Canadian Memorial Church in Vancouver (1926); and at Saints Peter and Paul Catholic Church in Vancouver, a 2008 commission depicting dozens of 20th century saints, one with a soccer ball, another a victim of a Nazi concentration camp. 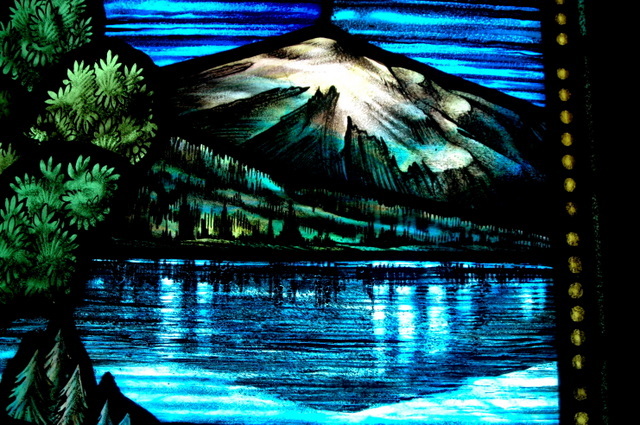 Mountain and Lake (detail) Vancouver School of Theology, 1935.